To enter my giveaway for Children's Book Week, go down to this post. I was sad to hear of famed children's illustrator Maurice Sendak's passing yesterday. Just by coincidence we read Little Bear last night. I read the hard parts and my son reads what he can. My daughter turns the pages. Thank you Maurice, for giving us plenty of memories like that. Enjoy the Wild Rumpus. I'm back to reading time travel romances. I have the newest Lynn Kurland, All For You, on my Kindle. I like it because all the previous time travelers she has written about show up as well. Literary critic's darling? No way. But I'm very happy with it. By the by, the fab blog Gato & Canard does a weekly feature called Multilingualism in my Family, and this week she's featuring an interview with me! Please check it out. What are you reading this week? What is your favourite Sendak book? I am reading Box Socials by W.P. Kinsella at the moment. I don't know if you've read it, but just before I went for dinner tonight I finished a chapter and I was in tears about it. I tried to explain it to my husband at dinner and just about cried! It's not generally a sad novel, but this chapter was quite sad. One of the interesting things for me is that it takes place in my neck of the woods in Alberta....I have friends from Magnolia, my BFF went to Entwistle school...he mentions Wildwood and Edson, two towns that I used to live in, and a character even went to my college, Camrose Lutheran College. So cool! Oooh I have read it. I love how WP Kinsella takes some of the saddest situations but gives the characters humour. The one I cried the most about was in Moccasin Telegraph, I think, where the father steals all his daughter's money that she worked so hard for. All of WP Kinsella's books make me homesick though, but I didn't live as close as you! I am probably just about the only person in the world who was/is not a huge fan of Where the Wild Things Are. Not because there was anything wrong with it, but because I just never connected with that book in any way. Weird? 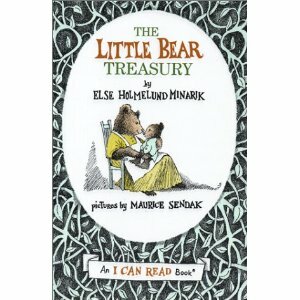 I do, however, love his illustrations for the Little Bear books. The man had talent and certainly made a lasting impression in the history of children's literature. I usually have so many books on the go that my responses to What Are You Reading Wednesday varies little week to week (still working on Les Miserables, The Book of Jeremiah, and Fruits Basket and my wife is still working on Harry Potter and the Goblet of Fire with our son). The only change this week: I'm also reading The Diary of Abraham Ulrikab and just about to start reading Racing for Diamonds (by Anita Daher) to my daughter. Reading The Secret Garden again. I remember hating it the first time I read it (I was 7). I didn't understand why a book would be written about two utterly unlikeable children! This time around I'm really enjoying it. Love the slow style and the gradual transformation of Mary and Colin. I've never heard of Little Bear. I must check it out.